Once dark, now too bright! You are here: Home / Anza-Borrego / Once dark, now too bright! Many winter festivals and holidays incorporate elements of light as part of the observances and celebrations. 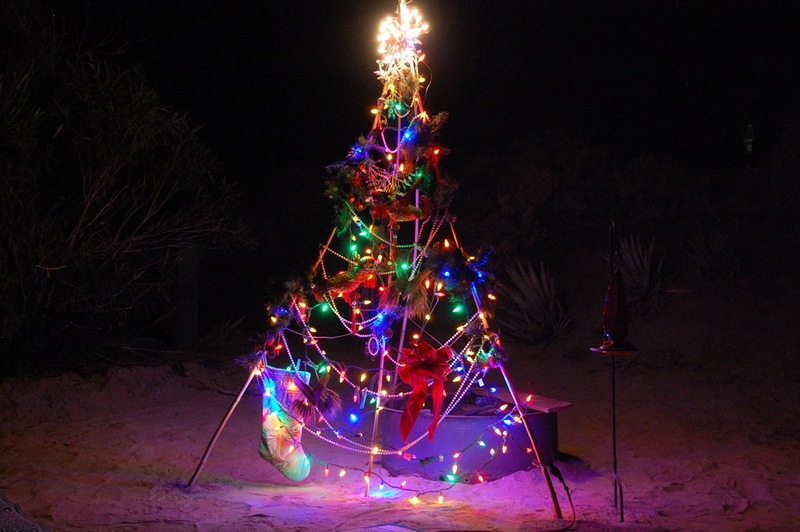 During the early evenings, we lit our outdoor Christmas tree that Larry made from homegrown bamboo. It lit up the trailer as well, but not enough to obscure the stars. 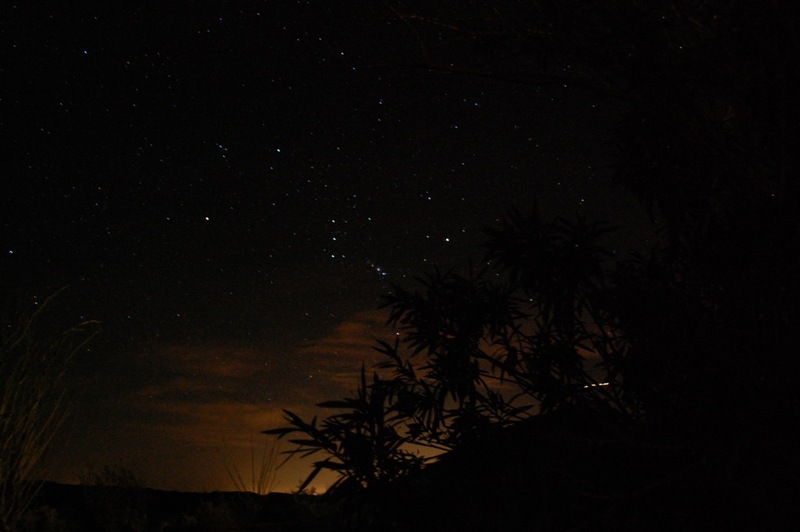 While writing this post, I became aware of the International Dark-Sky Association (IDA), a non-profit organization with the stated mission of “fighting to preserve the night”. The IDA is based in Tucson, a city famous for having a strong lighting ordinance to ensure that people use night sky friendly lights. 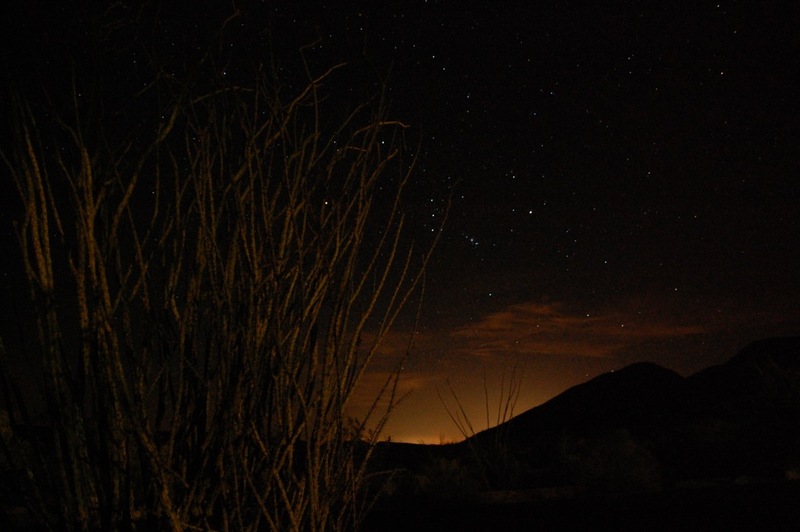 Their website provides guidelines for outdoor lighting to preserve the night sky and has designated Borrego Springs, California, as one of four International Dark Sky Communities that have met and exceeded their requirements. 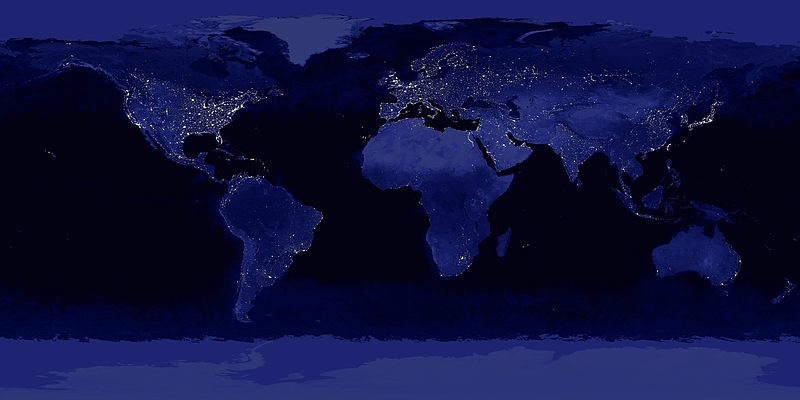 The extent of the worldwide expanding communities that emit light at night is revealed in this NASA-NOAA Satellite View of Earth at Night and this Time Lapse View From Space. According to the IDA, NASA’s new ‘Black Marble’ images of nighttime Earth “reveal that our globe is heavily littered with excessive and wasteful lighting that produces light pollution”. So I join in the celebration of the night sky by presenting the images above, but I must point out that the stars on the horizon are obscured, not by the sunset, but by the sky glow produced by the city of El Centro, 60 miles away! See and listen to the YouTube video, “Arthur C. Clarke on Light Pollution“. And, until your next opportunity to see a clear night sky full of twinkling stars, enjoy the breathtaking wonder of the night skies as seen in the YouTube videos, “Plains Milky Way” and “Yosemite Nature Notes – 19- Night Skies 1080p“. Read: “Progress in Fight to Keep Night Skies Dark“, Kate Galbraith, New York Times, October 17, 2012. Bill, glad you’ve become a proponent of dark skies and hope you continue to point your camera skyward. Your links and images are inspiring and are what I need to get me back out and beneath the beauty of the twinkling heavens. As you know, they’re exceptional at Borrego. Enjoyed story on night skies. 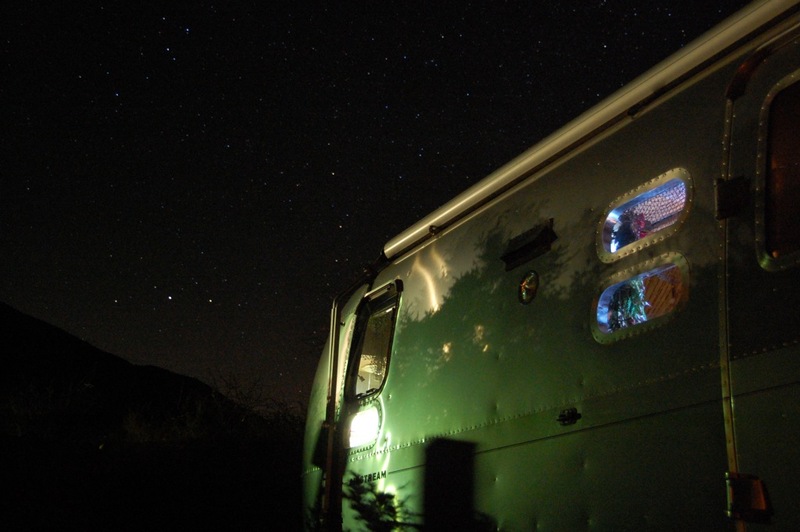 Will be showing a few night sky photos at Airstream gathering. Thanks, Bert, for your comments. 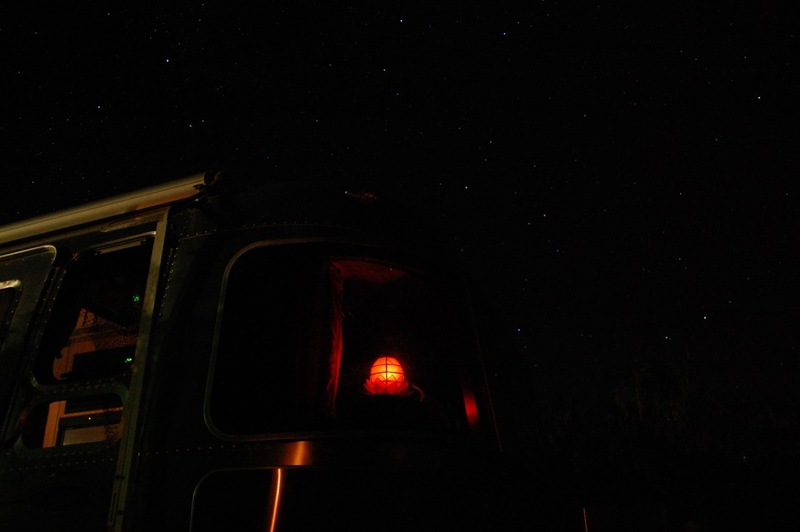 Glad you will be showing some night sky photos during your Airstream Photo Seminars at Alumafiesta in Tucson, Arizona, next month! A revised version of David Bowie’s “Space Oddity”, recorded by Commander Chris Hadfield on board the International Space Station.